A grandmother we know and love always reminds us that some of the best Italian recipes were born from left overs. When you find yourself with extra bread, we suggest making Panzanella, a Florentine summer salad of bread and tomatoes. The bread can be fresh, toasted, even a few days old and hard. The bread soaks up the dressing, making it soft and full of flavor. 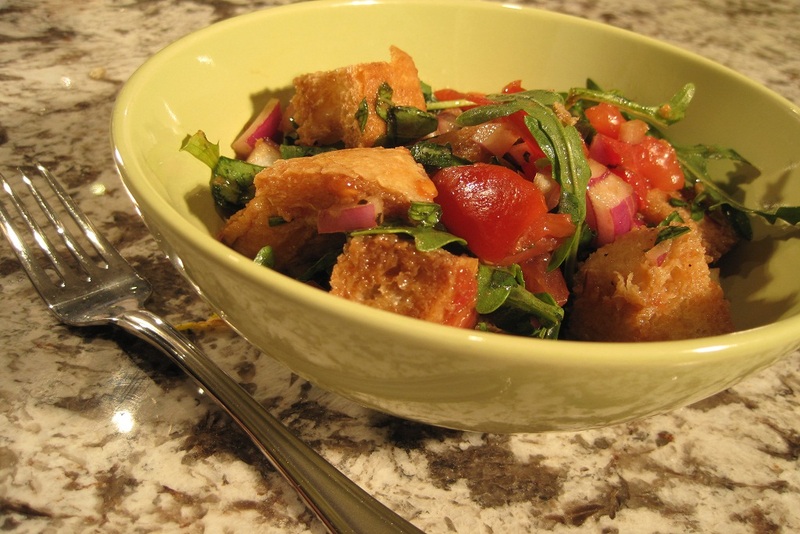 The most basic and traditional Panzanella includes bread and tomatoes dressed with olive oil and vinegar. Red onions, basil and cucumber are most commonly added. We encourage you to create your own version with varieties of lettuce and other seasonal vegetables, olives, artichoke hearts, garbanzo beans, cheese, capers, anchovies, and more. Here, we add arugula for some greenery and a peppery taste. This is a rustic salad by nature so the amounts provided are just suggestions. We encourage you to get creative and make this your own. Combine all vegetables except the arugula. Make the dressing by thoroughly mixing the olive oil, vinegar, garlic, salt and pepper in a separate bowl or container. Layer the ingredients in a large bowl. Start with about half of the vegetable mixture, followed by half of the bread cubes, then the rest of the vegetable mixture and the remaining bread, drizzling some of the dressing on each layer as you go. Cover and refrigerate for 30 – 60 minutes. Remove from refrigerator and add in the arugula and gently toss the salad, tasting to see if more salt or pepper is needed. If the bread is very dry, add more olive oil. A tip to save time: Cut the vegetables, bread, and prepare the dressing ahead of time. Wait to combine your ingredients until an hour before you need them. Depending on how soft you want your bread, you can make this several hours ahead. The longer it’s refrigerated, the more liquid the bread is allowed to absorb. If using lettuce, wait to add that to the dressed mixture. Our Madison and Wallingford cafes make a Greek version with our Rosemary bread. What’s in your favorite Panzanella recipe?